April 13-15, 2018 West Portal Sidewalk Art Stroll - Welcome to West Portal! San Francisco, Calif. — The heart of West Portal is a shopping district three blocks long filled with all the ingredients of a delightful small town: restaurants, movie theater, bookstore, pubs and Mom and Pop shops. 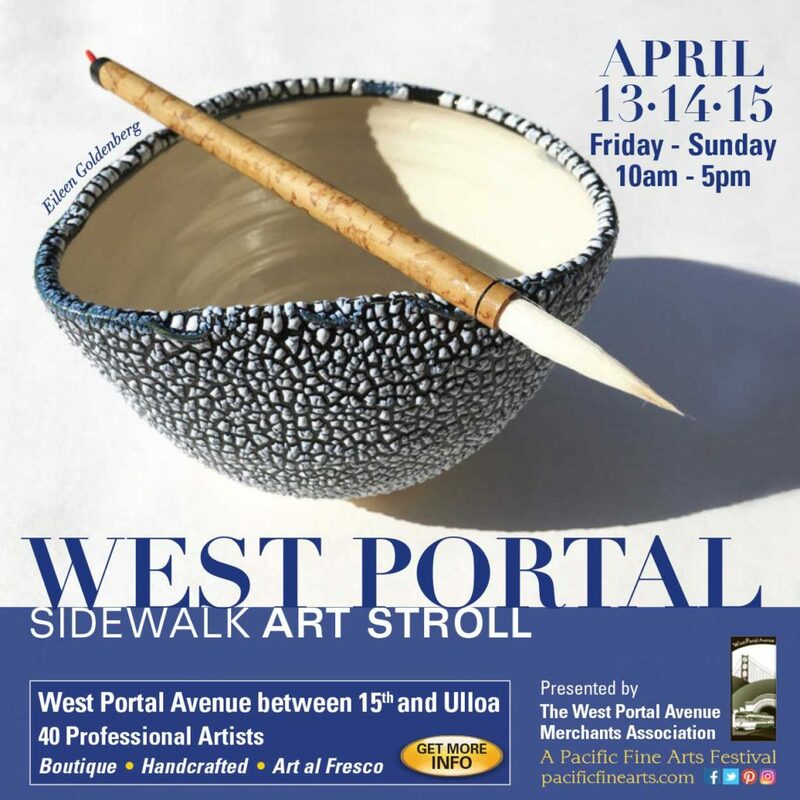 The weekend of April 13-15, this charming district will add to its appeal by hosting the West Portal Sidewalk Art Stroll—a boutique, handcrafted, family friendly art event. Now in its 30th year, the three-day open-air art marketplace runs Friday to Sunday from 10 a.m. to 5 p.m. each day on West Portal Avenue between 15th and Ulloa featuring the works of more than 30 artists displaying photography, paintings, ceramics, jewelry and more. The event presents a wonderful opportunity to enjoy the sights and sounds of West Portal, to meet artists one-on-one and discover a handcrafted treasure that calls to you. The show is free to the public and is presented by the West Portal Avenue Association. Gila Sagy’s passion for art, color and culture blend as seamlessly as the fused glass pieces she creates. “The many colors and textures of glass make fusing so fascinating for me,” she says. “Nothing can replace the excitement of creating beautiful color combinations with glass.” Her creations, which range from photo holders, jewelry, wine bottle platters and more are all original, unique and one of a kind. Everything is made of glass pieces in multiple colors and textures. The process of firing in the kiln fuses all of the individual pieces together, culminating in Gila’s elegant art pieces. From an early age David Rully discovered a love of woodworking, making such things as benches, and a desk among other things. Today he makes wooden spoons intended to be used even though there are those customers who say they are going to hang them on the wall. The paintings of Karen LeGault are set apart by a deceptive simplicity and a refined traditional Asian technique and aesthetic. Deeply rooted in Western realism and Taoist philosophy, her lush, distilled compositions express beauty, fragrance, rhythm and form through a magical palette where spirit is reflected through matter. She applies her extensive artistic skill, mastery and sensitivity to compose and balance color, shape, form and depth that engages all the senses, offering gorgeous paintings, commissions or prints that infuse with vibrant life and color the spaces in which you live, work and breathe. Located in San Francisco, Lisa Candee hand-designs, creates and sews one-of- a-kind original “take-alongs.” These bags and totes are handmade from new-life and repurposed, locally sourced fabrics. They are functional, durable and comfortable and have plenty of pockets so everything has a place to keep you organized for errands throughout your busy day. Lisa’s original take-along collection includes one-of-a-kind market bags, carryalls, totes and more. For Locke Heemstra’s photographic images, the focus on landscapes is very much the part of expressing appreciation and awe of the natural world. He creates photographic canvases that have a unique artistic appearance as the image continues to fold around the sides to the back, eliminating the need for frames or glass. Locke’s early images focused on the natural wonders of the United States, from the rich fall foliage of New England to the vivid blues and greens of the California coast. In time, he began to concentrate on natural and manmade settings lush with color and eventually decided to combine his love of European culture with his new approach to color. Today Locke travels to Europe at least three times a year– always searching for that special image that will give the viewer a sense of place. For more information about the West Portal Sidewalk Art Stroll contact the West Portal Avenue Association at (415) 566-3500 or Pacific Fine Arts Festivals at (209) 267-4394 or visit http://www.pacificfinearts.com/. You can also see more information on Facebook,Twitter, Instagram and Pinterest.